Three lessons daily in communicative grammar. One lessons daily in practical conversation. Two lessons daily in practical conversation. Two group classes daily in practical conversation. One private lesson daily in grammar. *Recommended for people who want flexible schedules, individual attention or professionals that want to have a very intensive Spanish program in a short period of time. Three lessons daily in grammar. Three private lessons daily, focuses on the individual needs. 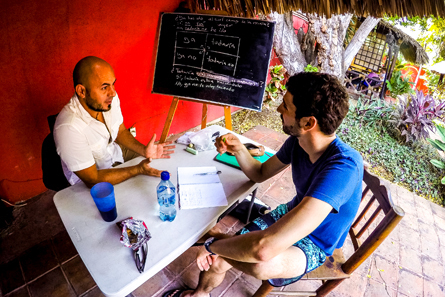 *Recommended for professionals that want to have a very intensive Spanish program in a short period of time. 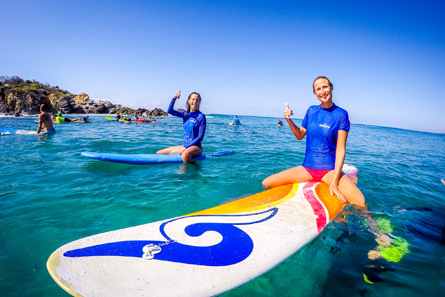 1 Day Class – If you are in Puerto Escondido and only need 1 class 1 day , we can advice taking the Travellers Course concept, you’ll learn the basic Spanish words and phrases to enjoy your vacations like check ins/out, ordering your food, greetings, ask for directions, take a cab, get around in the airport etc.. .
You´ll be attending school from 8:00am to 2:00pm. At Orientation we will provide your book, pen, papers and all you´ll need that day, you only have to bring a big smile and a desire to speak spanish. *1 Day students are Not required to pay any extra fee. 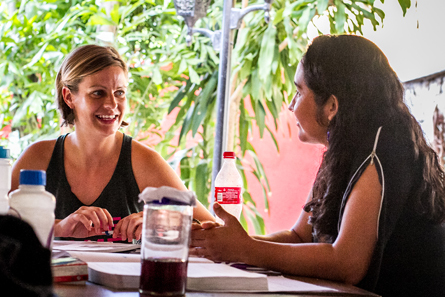 Spanish classes in Light and All inclusive packs are held in the mornings in our campus, starting at 8:00 Hrs. All programs include the transportation to the beach around 15:00 – 16:00 Hrs. 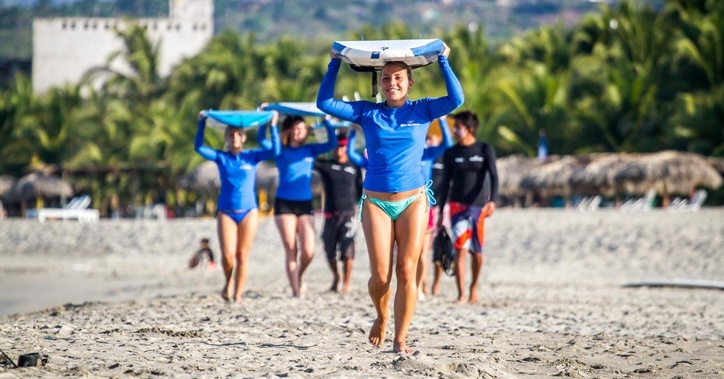 1 Day Class – If you are in Puerto Escondido and only have 1 day and you want to get the full experience, we can advice taking the Morning Surfer + Spanish Travellers concept, in the morning you´ll have a theory and practical surf class for beginners, later you’ll learn the basic Spanish words and phrases to enjoy your vacations like check ins/out, ordering your food, greetings, ask for directions, take a cab, get around in the airport etc.. .
We start at the SurfCamp at 8:00am for a theory and warm up session, we´ll then give you a swimsuit and a surf board and you are ready for the waves !. At 11:00am you´ll be attending school, we will provide your book, pen, papers and all you´ll need that day, you only have to bring a big smile and a desire to speak spanish. All you have to do is have the time of your life. Don´t worry about anything, we have you covered. If you take a spanish course we will charge the Material & Student Id according to the number of week you have taken. You can always later increase or change course depending on your trip.